Editor’s note: The social media video was removed Tuesday night. 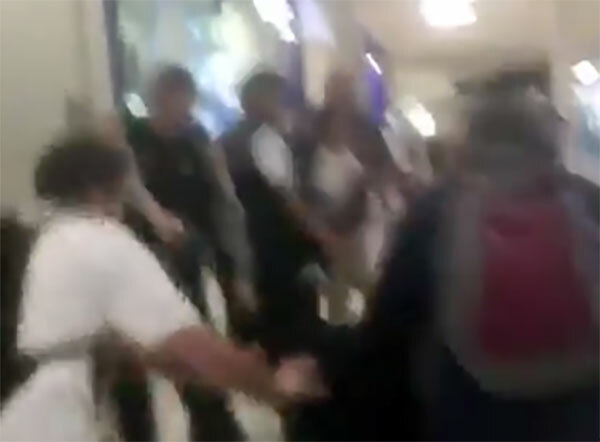 (Updated at 9 a.m) Video has emerged of an arrest in Tysons Corner Center mall that escalated into a brawl. Following the initial publication of this article, Fairfax County Police released the following statement about the brawl. Two young men were seen concealing merchandise at the Tysons Mall. Tysons Urban Team officers attempted to detain them and they resisted. Three other with them interfered with the arrest. Officers were able to take all five into custody but three officers received minor injuries. Two of the arrested complained of pain and were evaluated by the Fairfax County Fire and Rescue Department. Two of the involved were juveniles and released to their parents. Abdias Umana, 20, of Hyattsville MD, was arrested for petit larceny, two counts of obstruction of justice, and disorderly conduct. Cameron Reeder, 18, of Landover Hills MD, was arrested for obstruction of justice and two counts of petit larceny. Jairo Martinez, 19, of Hyattsville MD, was arrested for two counts of obstruction of justice and one count of disorderly conduct.